Stephen Charrier, President of Rollerblade USA, and Rob Gill, of InlineSkates.com, review the 2015 Rollerblade Tempest 100C Mens and Womens Inline Skates. Hey, welcome to the Daily Spin. I'm Rob from inlineskates.com joined today by Steven Cherrier - president of Rollerblade. Steven, thanks for being here. Thank you for having me. We're talking about a true performance skate now - the Tempest 100. Really cool skate. 100mm wheels on this skate. Yeah, this is a fast skate, Rob, for a lot of reasons. We're talking about the Tempest series skates and something that, the Tempest skates have a lower cuff to them. So, it still has an articulating cuff on it but it's not as tall as on a Macroblade or other skates in the line so... For sure. And what does the lower cuff provide? It allows a full stride while you're skating so if someone is skating on... this is a really long frame you can see on this skate, you need to be able to get a long stride out of your skate. It allows the customer to extend further their leg within their skating strides. For sure. And then another incredible feature on this skate is the carbon shell. Yeah, so the new Tempest skates this year come with a carbon shell on them which is a really great feature. Carbon is being very lightweight and very strong so transmission of energy through to the extruded aluminum frame is really, really positive. For sure. And then still sticking with the boot, talk a little bit about the overall fit. Yeah, the fit system, you know, you can see that it has an asymmetric liner to it so that means that the liner, the lacing is to the outside so the inside vamp of the skate is stronger. Again, skating is a lateral sport so it gives you more support to the inside. The skate has a ratcheting buckle, you can see, so you can really get that perfect fit, refining it the way you want and a strap over the instep to keep you back in the heel of the skate. Absolutely. And then a little different fit for the women, women's skate over the men's skate. So, the women's fit, like all Rollerblade's skates, the women's model has a different, it's not just a smaller size, it has a narrower heel, a taller instep to it and it puts the woman in a perfect kind of skating position basically. Absolutely. And now moving down. You're getting an aluminum frame, 100mm wheels but not just 100mm wheels, the Hydrogen Wheels. Yeah, so the Hydrogen Wheels. A wheel makes such a huge difference in the speed you get out of your product and Hydrogen Wheels basically poured in the USA, the best wheels. We set out to get the best wheels we can basically and it makes a major difference in the speed of the skate and the performance. This skate also comes with an extruded aluminum frame, it has racing axles meaning they thread right into the frame and it's just going to be a very fast experience overall. For sure. And then talking about the experience, who is this skate for? This is for someone who is looking for a fast skate. Someone who is training, you know, the one thing you'll notice when you look at four 100mm wheels is their frame has gotten longer now so it does skate differently. It's going to track really well skating distances. It's not going to be as maneuverable and if you're skating around a city, this probably isn't the right product for something like that. But it's going to be a fast skate, someone who's an athlete, someone who wants to skate some distances. Awesome. 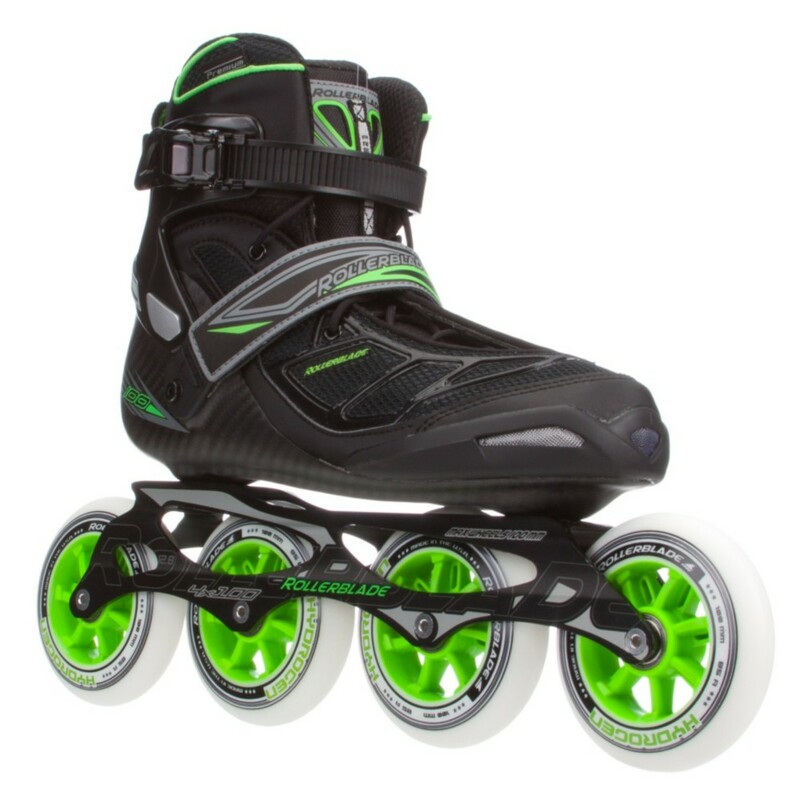 So, there you have it, the Tempest 100 men's and women's skates from Rollerblade. Thanks for joining us on the Daily Spin and you can check them out on inlineskates.com.